Channel 4's on-demand and catch up TV platform All4 is to be given a face-lift, that will be rolled out across all devices in the coming weeks. The on-demand channel’s brand new interface for big screens (smart TVs and games consoles) will launch in the coming weeks, followed by new look home screens on iOS, Android and All4.com. 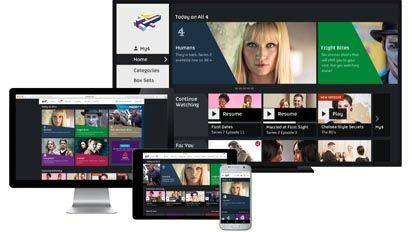 According to Channel 4, who announced the move at its Upfronts 2017 event, All 4’s user experience design and interactions will be "optimised for each platform in order to deliver an even more intuitive experience for the viewer. The new home screens will offer a tailored proposition combining ‘human’ curation with data-driven personalisation ensuring each user experiences the most relevant and engaging proposition for them." Channel 4 also announced a multi-million pound increase in investment of original and acquired online content for All 4 in 2017. This is in addition to brand funded series which continue to expand having delivered a total of 18 All 4 original series with 12 advertisers since Shorts launched in summer 2014. The All 4 commissioning team, responsible for defining and delivering the on-demand channel’s editorial offer, revealed eight new thematic strands that will form the basis of their future commissions and acquisitions. All 4 has evolved into one of the UK’s leading OTT channels, offering Channel 4’s key demographic of young viewers a wide choice of rich on-demand entertainment, for free! Continued innovation and investment has led to impressive Meanwhile, Channel 4 confirmed All4 had enjoyed a 28% year-on-year growth in views (including syndication partners such as Sky and Virgin), driven by All 4’s original and acquired exclusive content as well as Box Sets of iconic classic and contemporary TV. Foreign drama service Walter Presents from All4 has attracted over 15 million views since its launch in January. All 4 currently has 15 million registered viewers including over half of all 16-34 year olds in the UK. The service replaced 4oD last year.